During October–December 2005 a salvage excavation was conducted in the prison compound on the hill of the Megiddo police (Permit No. A-4411; map ref. NIG 21795–801/71965–95; OIG 16795–801/21965–95). The excavation, on behalf of the Antiquities Authority, was financed by the Israel Prison Service, with the support of the officers and jailors of the Megiddo prison and the participation of inmates from Megiddo and Zalmon prisons. The excavation was directed by Y. Tepper, with the assistance of A. Najar and F. Abu-Zedan (area supervision), E. Amos, Y. Finkelstein and M. Zoabi (antiquities inspection), Y. Lavan (administration), N. Sanduka (hot houses), H. Smithline and N. Davidov (photography), R. Kislev and J. Neguer (conservation), R. Abu-Diab, R. Levental and M. Diab (mosaic conservation), I. Sa‘ad, A. Fahima and G. Solomon (ongoing conservation), Y. Shaaltiel and Y. Alef (planning and conservation), P. Pascal and D. Gahali (aerial photography, Sky Balloon Company), V. Essman and V. Pirsky (surveying), T. Melchin (drawing and restoration), I. Berin, L. Belashov and N. Zak (drafting), A. Markov (registration), H. Tahan (pottery drawing), R. Vinitsky and O. Raviv (metallurgical laboratory), G. Bijovsky (numismatics), Y. Gorin-Rosen (glass), A. Sofer and Y. Carmel (plaster and frescos), L. Porat (pottery restoration), E.J. Stern and D. Avshalom-Gorni (pottery consultation), R. Talgam (mosaics), Y. Nagar (physical anthropology), M. Piccirillo, E. Alliata, I. Shatzman, J. Patrich, B. Isaac, Y. Tsafrir, U. Dahari, G. Avni, N. Getzov and D. Syon (scientific consultation), G. Stiebel (Roman military artifacts), Y. Shahar (historical sources) and L. Di Segni (epigraphy). The site is located on a spur south of Nahal Qeni and is identified with Kefar ‘Otnay. It was referred to as Legio during the Roman period because the Sixth Legion Ferrata was garrisoned on a hill northwest of the modern Megiddo Junction and south of Tel Megiddo (for a survey of the region and a detailed location map, see HA–ESI 115:29*–31*). 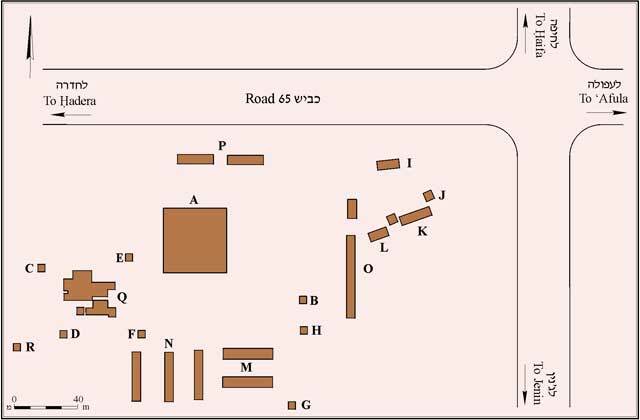 The excavation, conducted in Area Q, was a continuation of the extensive excavations in the Megiddo Prison compound (Areas B–P), which were carried out from 2004 to 2005 (Permit No. A-4125; Fig. 1). Twenty-eight squares were opened in the western part of the prison compound (Fig. 2). 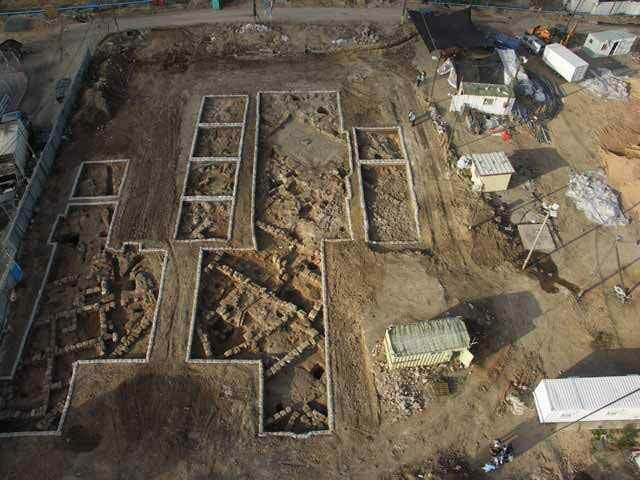 An alley in the middle of the area, flanked on both sides by buildings, courtyards and installations of a rural settlement from the Roman period, was revealed. A large building (at least 20 × 30 m) was exposed north of the alley. 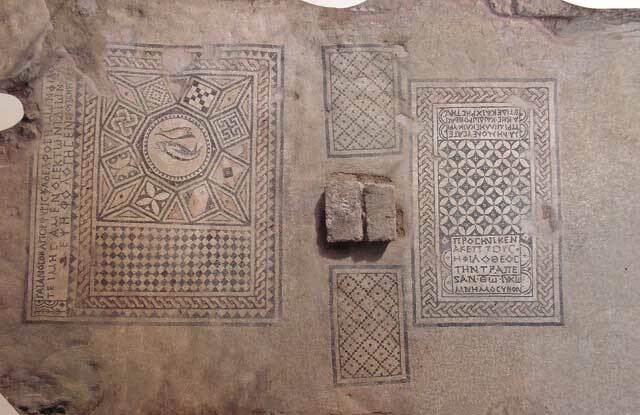 One of its rooms had a mosaic floor, which incorporated three ancient Greek inscriptions, dating to the third century CE. The room served as a ritual and prayer hall and one of the inscriptions was dedicated to God Jesus Christ. Remains dating to the Byzantine period and meager remains from the Mamluk period were also excavated (for preliminary results of the excavation, see Y. Tepper and L. Di Segni, 2006, A Christian Prayer Hall of the Third Century CE at Kefar ‘Othnay [Legio], Jerusalem). A square building (the ‘Southern Building’) in the southern part of the area was entered from the north via a long entrance corridor. A doorstep led to a courtyard with a beaten-earth floor. The walls were built of small and medium-sized ashlars founded on bedrock. Quarries where masonry stones were hewn and the leveling of bedrock indicated that indigenous materials were used in the building’s construction. Square rooms around the courtyard and the corridor contained storage installations. The corner of another building that was not completely excavated emerged in the northern part of the area. Subterranean caverns nearby contained fragments of pottery, stone and glass vessels, as well as bones. The ‘Southern Building’ continued to exist with only minor changes to its previous plan. The floor levels were somewhat raised and some of the subterranean caverns were sealed. 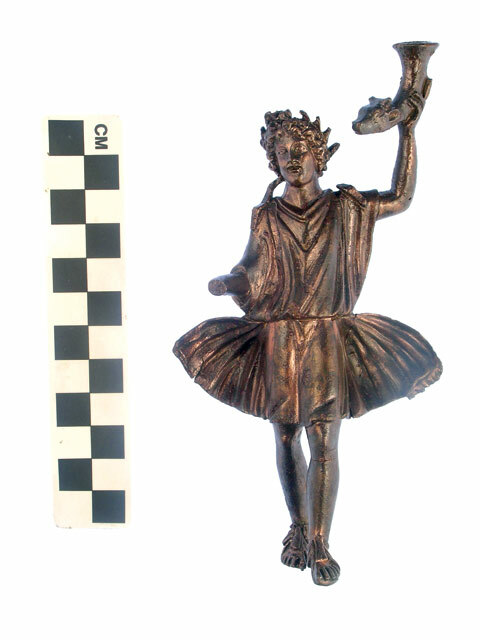 A bronze figurine of the household god Lar (Fig. 3), who was entrusted with the well-being of family members, was found on the floor in the western part of the building. West of the building’s entrance corridor was a small room with an entrance, which like the corridor, faced the alley to the north. Several sections of the alley (average width of 2.8 m) were exposed. Its floor was tamped earth mixed with plaster and potsherds. Another structure (the ‘Northern Building’; min. dimensions 20 × 30 m) to the north of the alley had a long entrance corridor, as well as courtyards and rooms that formed its wings. The remains of the building were damaged by modern construction and development work, particularly its southwestern part, where mainly the foundation trenches and quarrying lines had survived. Elsewhere in the building the walls were preserved two courses high. An inner courtyard (5 × 6 m) with a beaten-earth floor was exposed in the center of the building. A drainage channel built of roof tiles was revealed in its southern part. Fragments of roof tiles and architectural elements were discovered within and above the courtyard’s floor, among them a limestone column and capital. The wing to the north of the courtyard comprised parts of two elongated rooms and two square rooms. The floors of the rooms, which consisted of small stones and soil, were overlaid with intact pottery vessels, basalt objects and coins, dating from the first third to the middle of the third century CE. A special find was a Roman bread stamp engraved with the names of the baker and the military unit, for which the bread was intended. Six rooms composed the eastern wing of the building; the floors of several rooms, hewn in bedrock, were c. 0.5 m lower than the floors of the rooms in the northern wing. The rooms in the eastern wing were rectangular and connected to each other via narrow doorways. The soil fill overlying the floors contained fragments of pottery, glass and metal vessels, as well as coins from the third century CE, ballista projectiles, stone, ceramic and lead weights and a metal spearhead. Another outer courtyard (5 × 7 m) was located east of the building. Its irregular shape apparently stemmed from the system of alleys that continued farther east. The floor of this courtyard consisted of tamped earth, small flagstones and roof tiles. Set into this floor was a channel, composed of stone sections, found in situ. Above the floor, a stone basin was found, in situ, as well as another stone bread stamp that bore the carved names of the baker and the military unit for which the bread was intended and coins from the third century CE. A metal knife was recovered from the building collapse. Next to the walls of the outer courtyard were two ovens (diam. c. 1 m) made of clay with roof tiles and fragments of large pottery vessels that were incorporated in their walls. The southern wing of the building was survived by wall foundations, segments of floor beddings in rooms and small quarries. Coins that dated to the second and third centuries CE and a plumb bob of lead were found in rock-cuttings west of the building’s outline. A rectangular hall (c. 5 × 10 m; Fig. 4) with a mosaic floor was excavated in the building’s western wing. The rooms to the east of the hall probably functioned as service rooms; one of them may have been a foyer whose mosaic floor partly survived. The building’s walls were preserved to their foundation height. Probes dug below the floor revealed smoothed and straightened bedrock, overlaid with a bedding layer that contained fragments of pottery vessels dating to the Roman period, up the third century CE. The mosaic floor, especially in the middle of the hall, was overlain with a layer of potsherds, primarily jar fragments that mainly dated to the third century CE, while some were from the beginning of the fourth century CE. A thick layer of plaster fragments and pieces of colored fresco decorated with geometric designs, which had fallen from the walls, covered the layer of jar fragments. A base built of two dressed stones was in the middle of the hall, whereas in its western wall was the base of an engaged pilaster and a recess for a similar pilaster was in the eastern wall. A plastered semicircular recess in the floor was discerned in the southern side of the hall. The hall was paved with four panels of white mosaic, surrounding the central base. Rectangular mosaic carpets adorned with geometric patterns were laid to the east and west of the base. An ancient Greek inscription and an octagon with fish in its center, enclosed with geometric designs, were incorporated in the northern panel. The inscription mentions an officer in the Roman army who donated his own money for the construction of the floor; the name of the artist who built the floor is also noted. Two Greek inscriptions were integrated in the southern panel; one faced west and the other––east. The names of four women are mentioned in the eastern inscription and the name of another woman who donated the table as a memorial to God Jesus Christ appears in the western inscription. The direction and contents of the three inscriptions accentuated the interior circular layout of the hall, with the stone table base built in its center (below), around which the local Christian community apparently worshipped and prayed. Only the eastern part of the Northern Building was used in this period, particularly the outer courtyard and its adjacent rooms. The courtyard was reduced and rooms were built to its south and north. Secondary walls were also found in the rooms to its west. Walls and floor segments of another building were excavated to the east of the building and beyond the alley, revealing coins from the fourth century CE. Minor changes occurred in the Southern Building, south of the alley. The corridor was divided into a room and a courtyard and various-sized tesserae were found to be incorporated in earthen floors. A circular installation next to the wall was located in a room southwest of the courtyard, which contained, together with the adjacent rooms, dozens of coins that date to the fourth century CE, as well as fragments of stone basins and pottery vessels. A new structure, oriented southeast–northwest, whose rooms and walls negated those from the earlier phases, was erected. Rooms containing stone collapse were in the southern part of the area. A few rooms adjacent to the courtyards of the previous phases continued to be used in this period. A habitation layer that included a circular area paved with small stones was discovered in the northwestern part of the area. Animal bones, pottery vessels and coins were recovered. Remains that were connected to the prison compound from the 1950s to the 1990s, including barbed-wire fences and post holes that contained remains of wooden posts that divided the area into fenced-off enclosures, were found, as well as a communication trenches, cement foundations and drainage channels. The excavations show that in the Roman and Byzantine periods the ancient settlement extended at least as far as the current excavation area. The exposed buildings were on the western fringes of the settlement. A large building that served as a dwelling was erected in the third century CE. One of its wings was apparently dedicated to Christian worship and was used as a prayer hall by the members of the community. The archaeological and epigraphic finds indicate that women and Roman army soldiers were among the members of the Christian community. The dating of the structure to the middle of the third century CE is based on the numismatic, ceramic and epigraphic finds. The time period of the building therefore predated the recognition of Christianity during the reign of Constantine (the Edict of Milan in 312 CE) and its adoption as the official religion by the Council of Nicaea in 325 CE. The proximity of the building, laying on the edge of the settlement, to the Roman army fortress that Schumacher excavated at the top of the spur (G. Schumacher, 1908, Tell el-Mutesellim 1. Leipzig, Fig. 287), shows that Roman army soldiers lived in quarters located in a civilian area, alongside buildings of the Jewish village. 1. Map of excavation areas. 2. Area Q, looking west. 3. The Roman household idol Lar. 4. The Christian prayer hall mosaic, general view.